Click here for high resolution image of award winning product. Click here for high resolution image of award presentation. The Littelfuse SB6100 Industrial Shock-BlockTM GFCI wins Silver Award in the Plant Engineering 2013 Product of the Year in the Electrical Safety category. 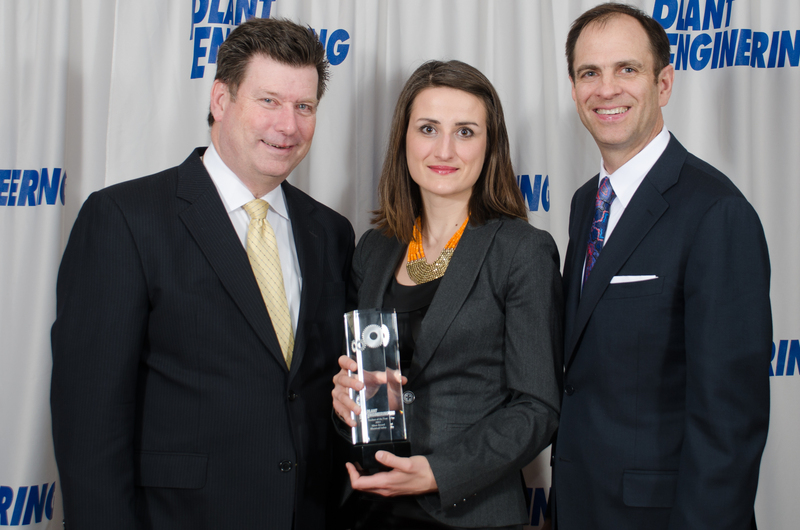 CHICAGO, May 5, 2014 — Littelfuse, Inc., a global supplier of circuit protection, power control and sensing products announced, that it has won a Silver Award in Plant Engineering Magazine’s 2013 Product of the Year contest in the Electrical Safety category. 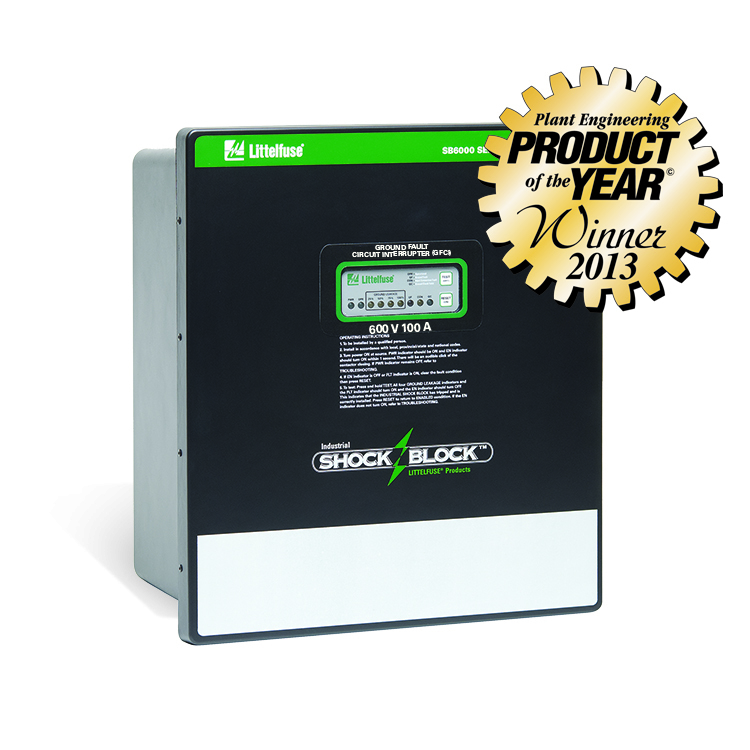 The SB6100 Series Industrial Shock-BlockTM is being recognized as an innovator in this category, contributing to safety and reliability in industrial facilities. What is unique about the SB6100 Series Industrial Shock-BlockTM is that it is the first and only ground fault circuit interrupter (GFCI) to meet UL 943 Class C and Class D requirements. It is different than a typical residential Class A GFCI, meeting industrial requirements including higher system voltage and higher trip levels, allowing for leakage currents experienced in industrial systems and a continuous load-ground wire monitoring. “Electrocution is one of the top causes of occupational injuries and deaths in the United States, according to the United States Department of Labor. Devices like the Littelfuse Shock-BlockTM help to improve worker safety by preventing such injuries in industrial facilities. We are honored that our product was recognized by Plant Engineering Magazine’s readers.” says Dan Stanek, Vice President and General Manager of Littelfuse Protection Relays and Custom Electrical Products. The SB6100 Series Industrial Shock-BlockTM is part of the Littelfuse Protection Relay line. It is an industrial ground fault circuit interrupter, which meets UL 943C. The new UL 943C listing is for GFCIs with higher voltage requirements, because residential GFCIs prove impractical for industrial facilities. The SB6100 can be used on systems up to 600V and allows for a leakage current up to 20 mA, much higher than residential Class A GFCIs to reduce nuisance tripping, while still protecting workers. High-voltage industrial GFCIs like the SB6100 can protect against electrocution in high risk areas where when people, equipment and water are present. Applications for this product include electrical cabinets supplying power to pumps, washers, mixers and any areas where operators, electrical equipment and wet conditions are present. Founded in 1927, Littelfuse is the world leader in circuit protection with growing global platforms in power control and sensing. The company serves global customers in the electronics, automotive and industrial markets with technologies including fuses, semiconductors, polymers, ceramics, relays and sensors. Littelfuse has over 7,500 employees in more than 35 locations throughout the Americas, Europe and Asia. For more information, please visit the Littelfuse website: littelfuse.com.